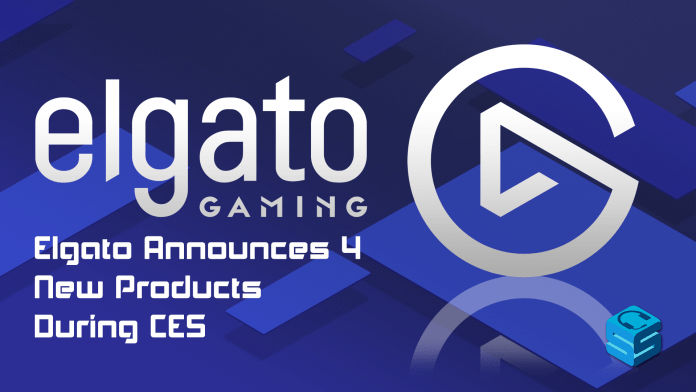 Elgato made a huge announcement right before they took the stage for CES, introducing four new products to their already impressive line up of products. FOUR! Are you excited? I am! Let’s check out the products and see what they bring. Lighting is an ever-evolving item in the world of streaming and entertainment. 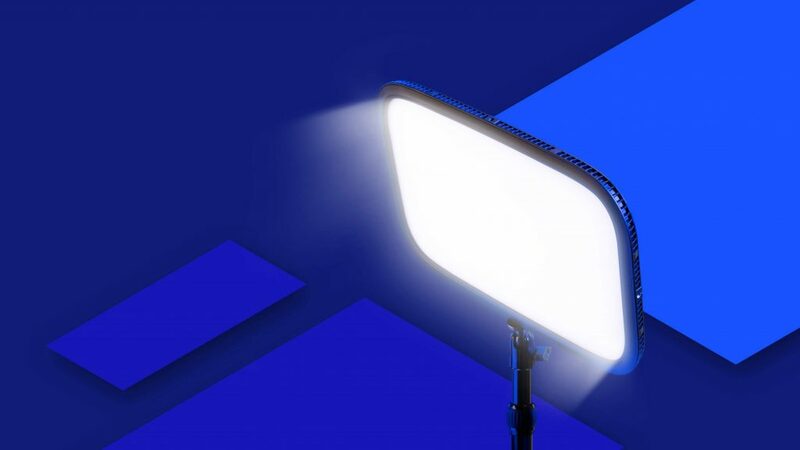 From Hue lights that change colors to umbrellas that soften the look, lighting is one of the most important looks to running a professional stream. Key Light hopes to be your one time stop to a quality picture. Low heat index with a 2500 lumen output, meaning you won’t be sweating when the action is live. A color range that ranges from a light blue to a beautiful amber, allowing you to customize just how you look on screen. Frosted glass face that disperses light wonderfully and gives a softer glow. One more major feature that deserves a paragraph would be how you control the lighting. No more needing to switch bulbs or use knobs to brighten or soften the lights. Everything can be controlled within the Control Center on your PC or even your phone. You can change the color and brightness of each light individually, making adjusting lights easier than ever. Even Stream Deck appears with the Key Lights, with adjustments, turning on/off, and saving different settings a breeze of pushing a button! I think they missed an opportunity with the recent craze of RGB but this isn’t a negative. There are the Hue Lights and Nanoleaf products that respond to Alexa that are quite popular right now, but the level of lighting that this product is providing is primary focus to the extra bells and whistles that RGB provides. The Key Light can be purchased now on Amazon! Are you a Clash of Clans champ? Does your dog do so many funny things that you wish you could catch them live? Want an easier solution than buying all the equipment that it takes to steam mobile efficiently? Screen Link is hoping to bring these options to you and provide an easy way to mobile stream effectively. 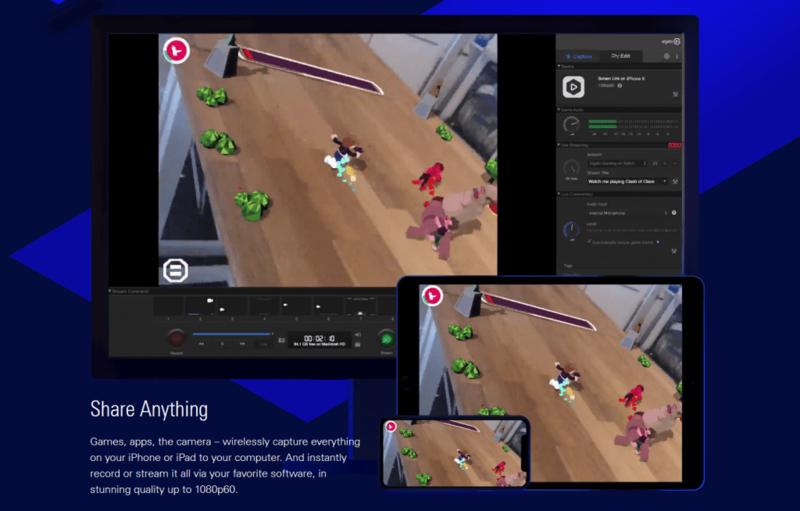 With Screen Link, you can wirelessly capture everything on your iPhone or iPad to OBS Studio, Streamlabs OBS, Xsplit, or Game Capture, all in 1080p60. Simply install the app and the plugin onto your PC to automatically have it appear as a source in your programs. After installation, simply click Broadcast in the Control Center and start recording! How does it work? Wirelessly of course. It hooks into the wireless network that your streaming device is on and links together through the Control Center. Once you download the app on your phone, it makes it super simple by providing a step by step video to setting it up. Once set up, you will have a free account to stream, which is limited to 15 minutes of capture. Upgrading to Screen Link Pro (coming soon) will cost $9.99 USD, but it will double your max bitrate and allows you unlimited streaming. The possibilities are endless with this one. The ability to take your stream with you when you go to get a drink, take a break to walk the dog, or decide to head to the living room after the stream for some IRL love. It makes it a seamless transition that usually involves disconnecting the stream and reconnecting with a separate program. Pro purchase will be available in-app. A DisplayPort that supports up to 4k monitors, so you can dual screen your production at any time. 2 Type-C USB 3.1 ports (Gen 2 with 10 GB/s) and 2 Type-A USB 3.1 ports (Gen 1 with 5 GB/s) to help with all of your file and transfer needs. 2 3.5 mm jacks, one in front and one in the rear, so you can connect your speakers and your headphones at any time. These sport a rate of 96 kHz and will mute your speakers when the headphone jack is plugged in. SD and micro SD slots that support all flash memory formats so photos and videos can be transferred in no time. A gigabit Ethernet port to plug a secure connection to the internet and provide faster speeds than most wifi routers. Thunderbolt App that helps disconnect all drives or devices easily. This provides an excellent improvement to most docks and adds some extras to boot. 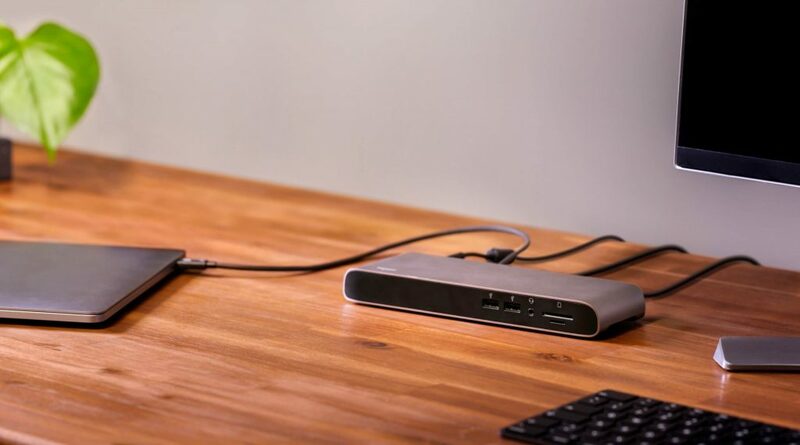 The Thunderbolt 3 Dock is available now on Amazon! 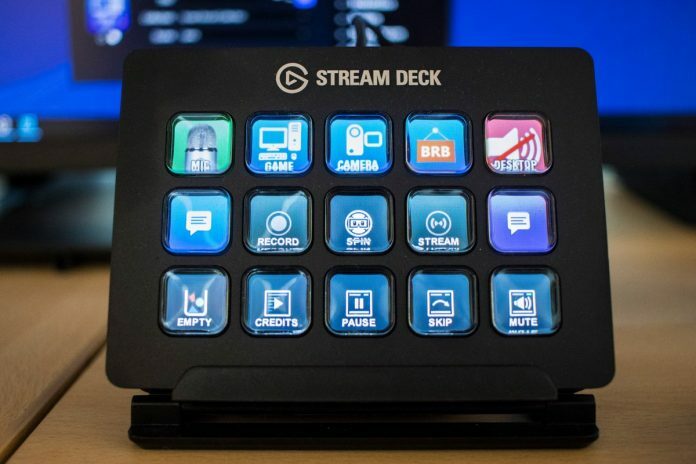 With the original release of the Stream Deck, Elgato wanted to make the ultimate companion to content creation. Now, with many updates under its belt, they are releasing the SDK so developers can take a crack at producing their own updates to the already wonderful accessory. With SDK release, Elgato is releasing an App store for the Stream Deck where developers can develop and release their products. This essentially allows complete visibility for future programs that can improve the market drastically. Ever had an idea that could be an amazing addition to the mix? Now’s your shot. There are going to be some major updates coming to the Stream Deck in the coming months with the flow of Apps hitting the store. Can’t wait to find out the next wave of amazing features! This is just the start to what looks like an incredible year for Elgato and Corsair! If this is how they are starting, I can’t wait to see how they top themselves! Next articleStreamlabs Introduces Face Masks!